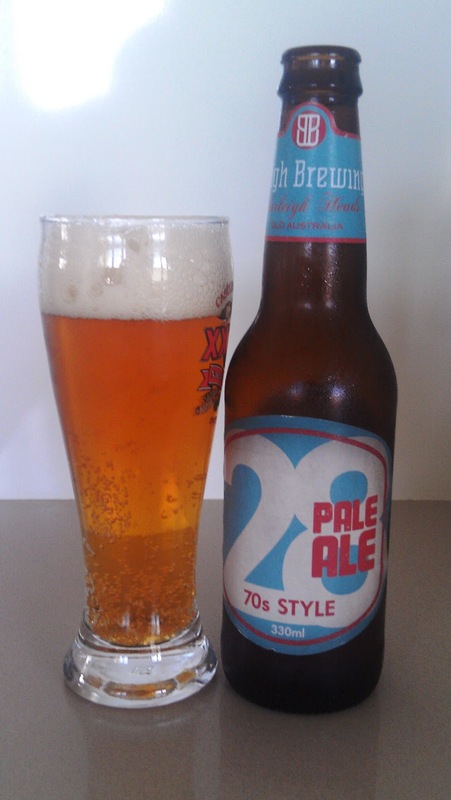 This Sunday’s Sesh is brought to you by 28 Pale Ale, brewed by the Burleigh Brewing Company. The one thing I love about boutique breweries is the way they name their beers. Other brews in the stable include Big Head (claimed to be Australia’s first no-carb beer), the Black Giraffe (a black coffe brew) and an English style bitter called My Wife’s Bitter. The blurb for this one says it’s a 70’s style pale ale. Well, I wasn’t around for most of the 70’s but if I was, I would have enjoyed this beer. It pours alot like softdrink – you can see the bubbles flying up the inside of the glass, as well as the size of the head – but it’s all beer. It’s quite bitter, but smooth, and tastes very home-brewy. This is the kind of beer if you’d brewed it yourself, you’d brag about it. I really enjoyed this one and will be adding this to my favourites to buy again in the future. We’re on the cusp of the end of the cricket season, and the beginning of the footy season here in Aus. How do I know? The NRL Allstar football match was on last night, and we’re into the Tri-series One-dayers in the cricket. Just before the Aus v India one-dayer started today, I caught the end of a charity cricket match in Wollongong, started by Adam Gilchrist three years ago. He had a few big names playing – Wendell Sailor, Merv Hughes, Darren Lehman to name a few – as well as some women’s cricketers and locals. It made me wonder, what happened to the old testimonial cricket match when a big-name player retired? The teams for these matches were typically composed of retired players, football players from all codes, a few women’s reps and media identities. The line-ups were enough to bring in bumper crowds, just to see all those big names together on one field. I know we can’t do that every time one of our players retires, but I think we need to take a leaf out of the NRL play book, and reinstate a charity match at the very least. It’s something that could be the official opener of the cricket season, getting us prepped for the upcoming tour matches, and getting us excited about summer to come. Twenty/20 has made cricket more popular since it’s inception, and it’s because it’s extremely exciting to watch. I love my test matches, but I also love sitting down and watching a match that has a result in under three hours. Why not combine the excitement of T/20 cricket with the fun of watching league, soccer and AFL players pit their wits against the likes of Shane Warne and Brett Lee? It showcases the game at it’s most basic level – and that is how anyone can pick up a bat and a ball and have a go. It does beg the question though – who would you have in your team?